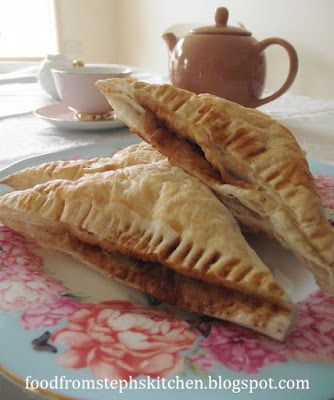 Apple turnovers are something I've always loved. They're what I pick at a bakery, and something I love to make at home! Usually turnovers a quite large and you end up needing to cut them in half. Well, that's what I always end up doing! These mini turnovers are the perfect size for one person. 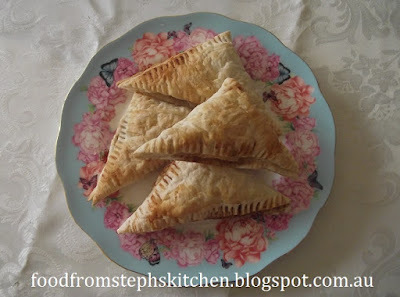 And conveniently, you can make four mini turnovers from a sheet of puff pastry. Once cooked you can let them cool and pipe in some sweetened wiped cream. I like to have mine hot with ice cream or cream for dessert. 2. Peel and core apples, cutting them into small cubes. Put apples in a small saucepan with a 1/2 tablespoon of water, and cook over medium heat (with the lid on) for 5 - 10 mins until the apple is soft. 3. Add sugar and cinnamon to apples and stir through. Put aside to cool slightly. 4. Cut the puff pastry sheets diagonally to create four small triangles. Spoon heaped dessertspoons of the apple mixture into half of each triangle (careful not to add in too much of the liquid from the apples). 5. Fill a small cup with water. Dip one of your fingers into the water and run it around the edge of the triangle. Fold the non-apple side of the pastry over the apples, pressing both sides of the pastry together. Take a fork and press it around the edges of the pastry to seal the turnover. Continue until all eight turnovers are sealed. 6. Line a large baking tray with non-stick baking paper. Place the turnovers on the paper and brush each one with a little bit of water or milk. 7. Bake in the overn for 25 mins or until they are golden all over. 8. Serve hot with cream or icecream, or let them cool, cutting the turnovers open on one side and pipping with sweetened wiped cream.